"The Outlaws hunt the Sheriff. The Sheriff hunts the Outlaws. The Renegade plots secretly, ready to take one side or the other. Bullets fly. Who among the gunmen is a Deputy, ready to sacrifice himself for the Sheriff? And who is a merciless Outlaw, willing to kill him? If you want to find out, just draw (your cards)!" 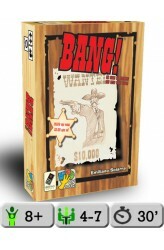 (From back of box) The card game BANG! recreates an old-fashioned spaghetti western shoot-out, with each player randomly receiving a Character card to determine special abilities, and a secret Role card to determine their goal. Four different Roles are available, each with a unique victory condition: Sheriff - Kill all Outlaws and the Renegade Deputy - Protect the Sheriff and kill any Outlaws Outlaw - Kill the Sheriff Renegade - Be the la..
BANG! 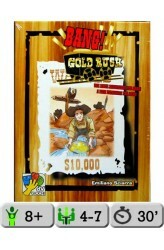 Gold Rush is an expansion for the card game BANG! that can be used with the base game alone or mixed with other expansions. In addition to featuring eight new characters, BANG! Gold Rush adds two new mechanisms to game play: • Players can collect gold nuggets to buy equipment, with the equipment giving your character new abilities and you the chance to develop new strategies. • Even when a player is shot down during the game, he can come back to play with the Shadow Gunslinger variant. When that dead player's turn comes around, he temporarily re-enters play and takes his turn as if he were alive, now giving an eliminated player the chance to affect the outcome of a game. Look out for shots from beyond the grave! https://www.youtube.com/watch?v=V7sHrruKgeA .. In the U.S. wild west, the eternal battle between the law and the outlaws keeps heating up. Suddenly, a rain of arrows darken the sky: It's an Indian attack! Are you bold enough to keep up with the Indians? Do you have the courage to challenge your fate? Can you expose and defeat the ruthless gunmen around you? Bang! The Dice Game keeps the core of the Bang! card game in place. 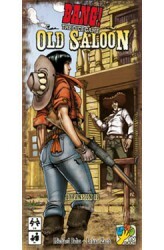 At the start of the game, players each take a role card that secretly places them on a team: the Sheriff and deputies, outlaws, and renegades. The Sheriff and deputies need to kill the outlaws, the outlaws win by killing the Sheriff, and the renegades want to be the last players alive in the game. Each player also receives a character card which grants him a special power in the game. The Sheriff reveals ..
BANG! 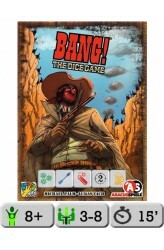 The Dice Game – Old Saloon consists of five modules that can be used individually or in any combination with BANG! The Dice Game. The expansion features lethal new characters, extra roles, new tokens, and two Saloon dice: the Loudmouth and the Coward. https://www.youtube.com/watch?v=qXezczS6kOQ ..
BANG! 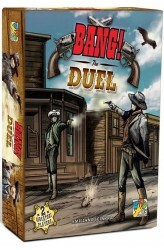 The Duel is a two-player version of BANG! in which each player chooses a certain number of characters from a personal deck, with one deck containing lawful individuals and the other one outlaws; the more characters you choose, the longer the game. Each player starts with two characters in play, with one being in front of the other. Each player also has an individual deck of action cards, with the lawful player specializing in drawing cards and the outlaw player specializing in tricks. Players take turns playing cards, trying to take out the opponent's characters. As you do, new characters come into play, and whoever eliminates all of their opponent's characters first wins. https://www.youtube.com/watch?v=wqlitZTbL-Y ..
BANG! The Valley of Shadows — first available only as BANG! Udoli Stinu in the Czech and Slovak Republic — is an expansion for the BANG! 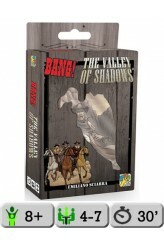 card game that includes eight new characters as well as rattlesnakes, tornadoes, ruthless "bandidos" and other threats for those fearless gunslingers who would dare enter the Valley of Shadows. The cards in BANG! The Valley of Shadows are based on submissions from players in the Czech Republic, with design help from BANG! author Emiliano Sciarra. 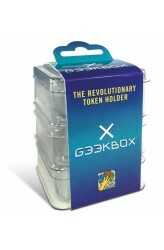 ..
http://www.g33kbox.com/ De Geekbox is een simpele en betaalbare opslag oplossing voor jouw favoriete spellen. • Drie doosjes die je op elkaar kan stapelen • Voor elke soort tokens en ander spel onderdelen. • Verwijder de deksel en je bent klaar om te spelen! “I cannot recommend them higher. Get them!” TOM VASEL, THE DICE TOWER https://youtu.be/twBnO0_rcrI ..